Welcome to CRD Enterprises, Inc.
CRD Enterprises is manufacturers representative and distributor to the non-ferrous metal casting industries. We provide products for the zinc die casting and aluminum die casting industries as well as for others non-ferrous casting products. *Plunger Rings of Stainless Steel or Cast Iron - U.S. and Metric Sizes available. Nozzles, Ball Noses, Plungers and Plunger Rods made to order. Shot Sleeves - D.T.I. - Build to your design. Competitively Priced. Excellent Deliveries. Send us your drawing for a quotation. Shot Rods, Couplers, Split Rings, Shot Bushings - Replacement Machine Parts - DIECAST Equipment Co. - Send us your drawing for quotation. 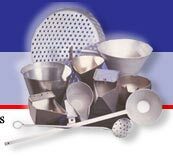 *Hand Ladles & Skimmers - CHURCH METAL -- in stainless and mild steel. Auto Pour Ladles - For all makes of ladlers; Custom Designs also available. INDUSTRIAL INNOVATIONS - Shot Sleeve Hones, Lube Proportioners, Reciprocating Sprayers, Process Monitors. J & A ENGINEERING, INC. - Die Spray Manifolds for all makes of reciprocators. * Denotes: Products stocked in our Lake Zurich facility for same day shipment of your order. Also, please visit Die Cast Equipment Co. for the finest quality zinc or aluminum machine parts at very competitive prices. ©copyright 2005 CRD Enterprises, Inc. all rights reserved.